I was holidaying in South America a couple of weeks ago when the internet announced my inclusion among the fifty Cleo Bachelor of the Year finalists. Twitter and Facebook starting fluttering about all the 2011 bachelors immediately and some of posters were even kind enough to flutter about me. At the exact same time I was in a bathroom in Mendoza, Argentina involuntarily emptying my body of its insides. I had eaten a bad and congealy Creamy Pasta earlier in the day (I was later told one should never order foods with adjectives in the title – Thick Shake, Hot Dog, etc) and was cramped over a toilet bowl working my damned hardest to switch efficiently between my mouth and my backside. We’ve all had to do this at one stage of life or another. It’s horrible. You want to die. I did it for hours while folks at home clicked ‘Vote’ next to my soft-focus face. It was horrible. I wanted to die. Having said that, I’m totally flattered I was asked to be one of this year’s bachelors. I think it’s great that Cleo looks to writers when forming their annual pool of eligible dudes. 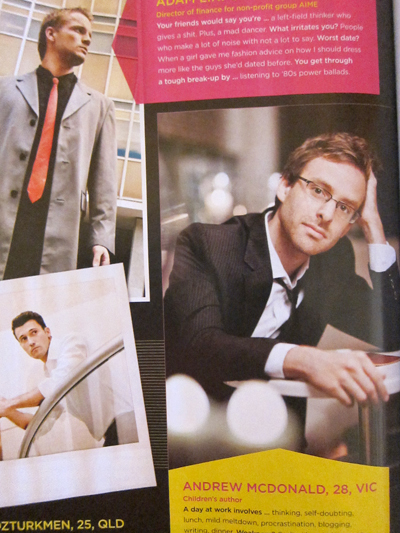 Last year the super-talented Craig Silvey was a Cleo bachelor. This year Nam Le and Jon Bauer must have missed the call and not checked their voicemails. Not me though. I always check my voicemail. Otherwise I’d never hear from my extended family. Or my publicist. It’s obviously a pretty strange thing being a Cleo bachelor. My mum says she’s become quite the celebrity at work. And when people try to talk to me about it I find myself either guffawing all over their shoes or denying the fact completely. And then there’s the age-old question: are all the bachelors really bachelors? Let’s just say that it’s similar to the Miss Universe beauty pageant in that Miss Universe is never actually a member of the family Universe. So far all I’ve done in the name of Cleo bachelorship has been rock up to a photo shoot and vote for Paul Verhoeven. Although the Cleo bachelor party happens in Sydney soon, which I am sure will be a Life Experience like I’ve not had before. I’m looking forward to it. The only other thing I’ve done in my Cleo bachelor duties has been to answer a long list of Getting To Know You questions that they send to all the bachelors. A few of my answers to these questions were published online and in the magazine, but I thought I’d share the entire list with you here. If nothing else, it’s fascinating to see what a Cleo bachelor gets asked. Thinking about and making plans for whichever project I’m meant to be writing that day. Then completely self-doubting myself about the worth of said project. Then lunch. After which, a mild meltdown involving tears and fingers running through hair. Followed by a procrastinatory hour of blogging. And then a good hour or so of quality writing before dinner. A lot of people say that writers are tortured and dramatic creatures but I personally can’t see it. Pixar. I don’t think there’s many children’s authors (or authors in general) who don’t worship the company and envy the amazing storytelling that takes place in every single film they seem to put out. Down to earth, friendly and very talented – with only occasional bursts of megalomania. Macca. And that was the closest I ever got to being on the football team. I think Buffy creator and movie/TV guru Joss Whedon is pretty fantastic. If I could create the complex universes and characters he has I’d be happy with myself. The fictional character you most resemble? Physically I’m Willy Wonka (colourful dresser), emotionally I’m Fantastic Mr Fox (erratic and mischievous) and mentally I’m Matilda (I like to think I have super powers). All stories must have a beginning and a middle. (It’s a motto-in-progress). The last lie you told? “No, Mum, just because I’m having leftovers of the leftovers from the weekend for dinner, doesn’t mean I’m a struggling writer.” I was and I am. The last text you received? I do an impressive karaoke rendition of the Jackson 5’s ABC. How about putting photos of myself on the internet, in the form of a silly blog post called ‘A Pictorial Guide to Avoiding Camera Loss’, and having all manner of strangers, ex-girlfriends and distant family members get in touch after it went viral. Ants on the kitchen bench. Freaking infuriating. Showing a new piece of writing to someone for the first time. Not that I’m a sucker for approval, but it’s scary giving something you’ve been working on alone for a long time over to someone who is not you. I had a particularly big amount of fun around the age of ten. Pretty much everything was a good time back then. Which no doubt is why my book The Greatest Blogger in the World is set during that time of life. I was reliving the good ol’ days. Best/worst dating advice you’ve ever received? That old saying about the body language of feet has misled me on more than one occasion. Apparently, if someone’s shoes are pointing towards you it either means they like you OR they’re just standing near you, completely pheromoneless. Like I said, misleading. Romping about New York City for a week with a (then new) special someone would probably be the best weeklong date I’ve been on. And the worst is always when you realise, half-way through the date, that it’ll be the last date. From there: downhill. …a good book recommendation. I’m completely trusting/loving of anyone who puts me onto books I’m going to adore. Craziest thing you’ve done for a girl? In primary school I had a rather large crush on a girl in my class, so every day after school I would climb a tall tree near her house and watch her walking home. On reflection that does sound more creepy than crazy, but we didn’t have Facebook back then so people were forced to stalk IRL. Your trick to impressing her mother? I do a lot of name-dropping. My mum this, my mum that. Sometimes the brief mention of a grandmother. Girlfriends’ mothers like to know that you’re friends with your own mother. So lots of allusions to motherliness are good. Although I avoid references to MILFs and Mofos. How do you deal with break-ups? I usually jump on my lappy and spend some time deleting all of the ‘us’ songs from my iTunes. Then wonder how every Radiohead track became our ‘us’ song in the first place. Then wonder even more how I’m going to deal with a break-up sans Radiohead. My collection of Tintin books. It’s exhaustive and dear to my heart and is the one thing I’ve been collecting all my life. Garlic. I loves it! It’s the strong, overstinkyness of garlic which becomes my weakness when I try to reconcile it with a love life. The garlic always wins. Love lives always lose. What/who are you obsessed with right now? Bored To Death – the latest HBO comedy – is a cracker. It stars Jason Schwartzman, Zach Galifianakis and Ted Danson and follows a struggling writer who makes ends meet by becoming an unlicensed private detective in NYC. Hilarious. Film/book/album that changed your life? The old (and in parts terrifying) Disney film Sleeping Beauty taught me to fear as a boy, Arthur Miller’s The Crucible opened my eyes to the world as a teenager and Radiohead’s Kid A (whilst not their best album) showed me that suicidal creative pursuits can sometimes make money. …read so many more books than men. As soon as you leave primary school the reading gender scales tip dramatically towards women. I find it somewhat inexplicable. C’mon guys! Don’t you know books are cool and ‘nerd’ is the new ‘buff’. I love me a community radio station. In Melbourne, Triple R and SYN are the winning background soundtracks to my day. What word/phrase do you overuse? I overuse ‘suddenly’ a lot when I’m writing. It’s a cheap and nasty way to tell the reader to have a heightened sense of expectation. Which doesn’t mean I don’t still use it. …cancelled after the pilot and lucky to even warrant a Wikipedia entry. I like the way Tina Fey plays up the slob/dag angle to the point that it becomes alluring. I’d like to get there one day. As soon as I get past the slob/dag stage. The Guardian for news, Spike – the Meanjin blog for Australian literary stuff and awkwardfamilyphotos.com for laffs. …conviction. Either you’re Partying, Working, Relaxing or Enduring A Family Gathering. As long as you dive head-first into whatever it is and don’t dilly-dally about everything will be alright. The woman you’d like to be for a day? Marilyn Monroe. People are always saying they’d like to invite her to the ultimate fantasy dinner party. And I do enjoy dinner parties. Plus I’d love to meet the other dinner guests like Jesus, Abraham Lincoln, etc. …substituting the word ‘pad’ for ‘apartment’ in conversations. Sometimes I’d even invite people back to my BP. Although that line stopped working after the oil spill last year. It really was a public-relations disaster. …releasing a new book in 2012. 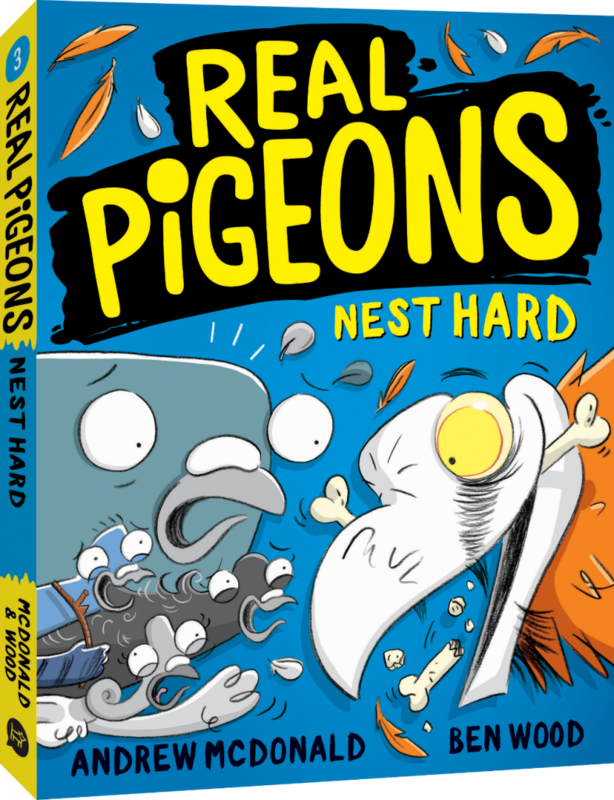 As well as the general excitement of having a new book out, it’s refreshing to do school visits to talk about said new book. Visiting ‘the kids’ is definitely the coolest and loveliest part of being a children’s author. Next thing on your plate? Finishing off the new book and starting work on the one after that. A writer’s work is never done, just endlessly redrafted. Children’s authors aren’t just for children. I also expect you to stockpile lame celebrity gossip at the party and then relay it all to me. Thanks!